Semihard universal cover case with an integrated magnetic plate. UNIVERSAL 4.7" - 5.0" UNIVERSAL 5.0" - 5.2" UNIVERSAL 5.2" - 5.5" UNIVERSAL 5.5" - 5.8"
Semihard universal cover case. This durable case is made with an easy-to grip material that provides superior in-hand comfort, shock absorption plus impact and scratch protection. Full access to all the controls and features. 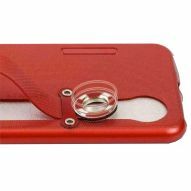 This case is equipped with an integrated magnetic plate that allows perfect adherence to any magnetic support. Features: full access to the touchscreen controls and ports; integrated magnetic plate.